New Look 6429 - why do I do this to myself? I chose this dress because I knew it would be functional as a nursing friendly dress. To make sure the neckline would stretch far enough to pull it down for access I sewed some clear elastic around the neckline instead of iron on stabiliser which is what I usually do for knits. Doing this also had the added advantage of hugging the neckline in to my chest so that nothing untoward is on display. It is simple and easy to make, and took hardly any time at all which are not good reasons to make something but at least are a consolation prize when things don't turn out as well as you want. But since this dress works and is functional, and I always seem to have a baby hanging off my hip which distracts from how the dress looks on me anyway I've still worn this a few times in the last week. So it's not a complete failure I guess! When people find out that I sew my own clothes, most will say something along the lines of being lucky to be able to make exactly what I want, when I want and not be restricted to what is available in the stores. To a certain extent that is true - I could sew a summer dress in the depths of winter if I wanted and ignore passing trends for the style I favour. But I don't think it's completely possible to make exactly what I want all of the time. The clothes we make are limited by fabric availability, time to sew and the necessary skills in some circumstances. For this reason I don't ever see my wardrobe being completely self made as some bloggers aspire to, and I am quite happy to clothes shop sometimes. I've never really had a problem finding clothes I like, or clothes that fit - my real problem is that I can be a bit stingy and am quite picky in terms of quality of fabric and production! 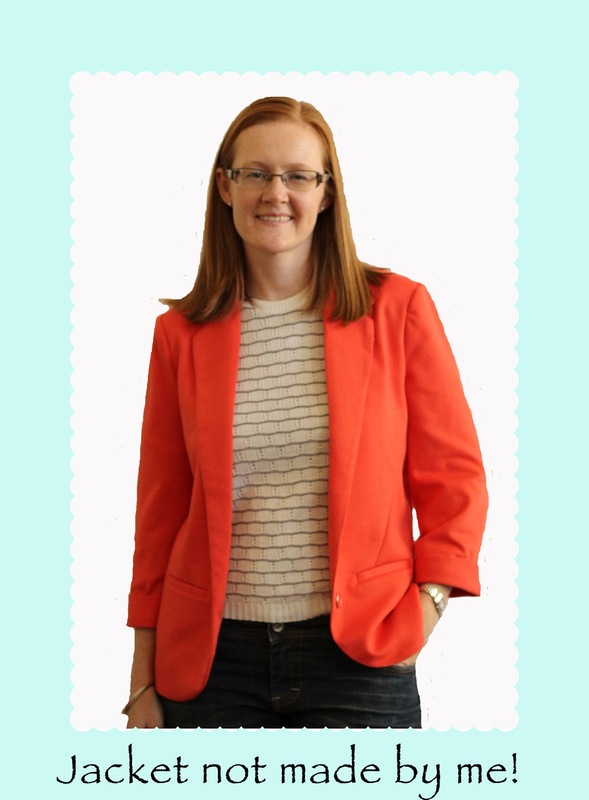 I've been loving the soft blazer look that's been around for a while, and have had on my to do list a blazer made from a ponti knit in an emerald or kelly green but hadn't really been able to find a fabric in the colour and weight I wanted. And then we recently had a weekend away with husband's work to a golf and spa resort (yes I managed to slip in a facial! bliss....) so I needed wanted something new to wear, but certainly didn't have the time to make anything. I'm so glad I did get the coral instead of the grey, I think the coral colour suits me nicely and I just love this jacket. Because it's a knit fabric it has some stretch and is comfortable to wear, and putting a jacket on instead of a cardigan or sweater just seems to give a simple outfit a real lift. So while I do still plan to make a jacket when the right fabric comes along, I'm happy to have purchased this. And I even paid full price too! Enough about my clothes shopping - this is a sewing blog after all and not a fashion blog. Have you all seen the petition started by the Sewing Princess to urge the powers that be to improve the Burda magazine? I definitely agree with the points Silvia has made - their patterns have become repetitive in the 5 years I've been subscribing, the instructions have always been *ahem* challenging, and some of the crazy simple things they provide a pattern for are just silly. I wouldn't mind fewer patterns if they were all really good patterns and also if it meant the tracing sheets were less complicated (my eyesight is bad enough as it is!). So if you're of the same opinion, pop on over and sign the online petition. 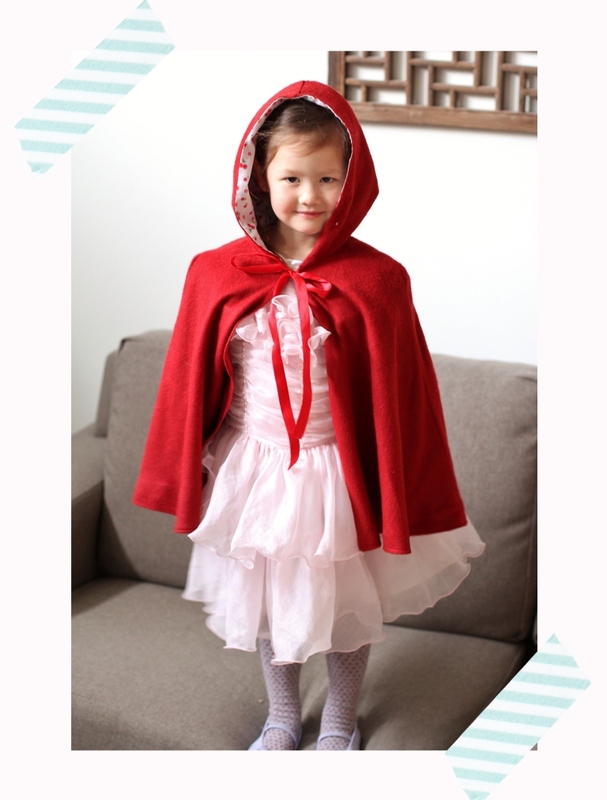 No I haven't got my fairytales mixed up - "Princess" Red Riding Hood is the compromise reached with a very strong willed 3.5 year old! 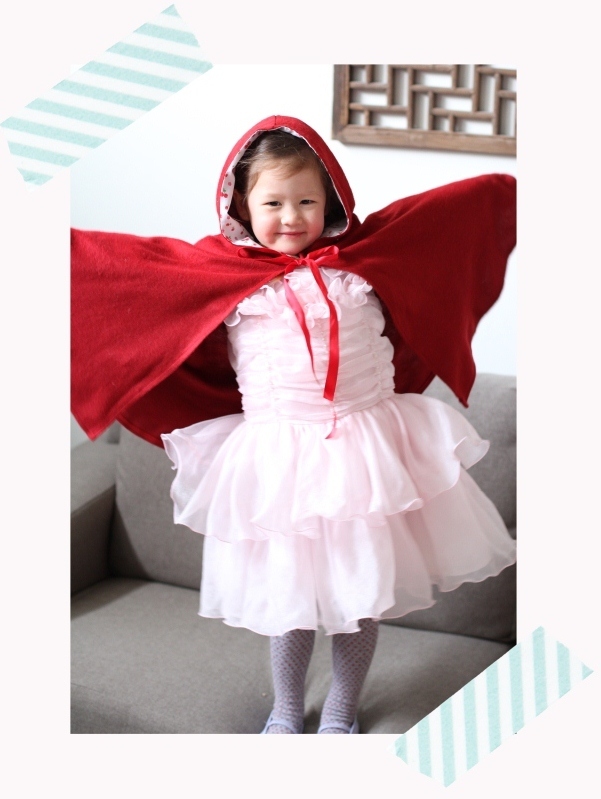 I don't know if this is a worldwide thing, but here in Australia there is an annual Book Week, celebrating reading and books, and practically every school (and daycare centres it turns out) has a Book Week parade where the kids dress up as their favourite book character. I have fond memories of the costumes I wore when I was kid as my parents were very creative, and as an overly crafty mummy with skills and resources I've been itching to get into the costume thing! However Anna's favourite book is called "Mutt Dog", about a stray dog that gets kicked out of various places before finding its forever home with a family in the country. Anna delights in yelling out "go away you mutt dog" at the top of her lungs at the appropriate points in the story, but I couldn't see any costume possibilities in that book! Luckily we've also been reading a beautiful pop up version of Little Red Riding Hood, so she agreed to go as Little Red Riding Hood for her book week parade at her daycare. 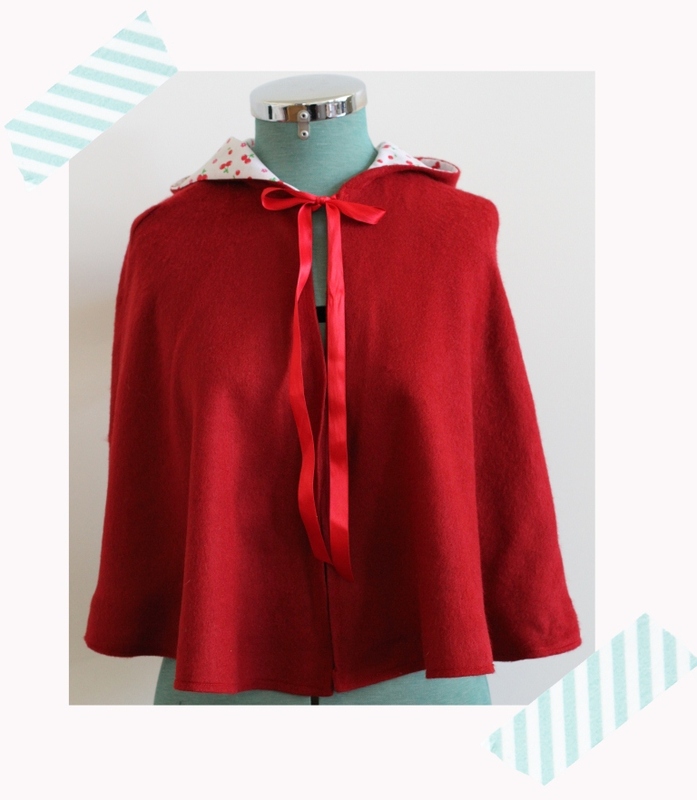 I lined the hood bit only with a cherry print cotton voile, and used a big red ribbon tie at the neckline. This was so simple to make, seriously just a few seams and probably an hour's worth of sewing at most. I had been thinking of making a little gingham apron to wear over a dress to complete the look, and was looking around for a basket for her to carry when Little Miss Three arrived home from daycare the night before the parade and said she now wanted to go as a princess like all the other girls, and she wanted to wear a frilly pink dress I bought from an op shop a while ago. A discussion about standing out from the crowd, and being a leader not a follower held no sway with a 3 year old who has princess fever, so I pretty annoyed. Threats of never sewing her anything ever again didn't work (she knew I wouldn't follow through on that one!). Ahhh kids, it's a good thing you love them because they can be ungracious little mites sometimes! Thanks for all your lovely comments on the jacket in the last post: I was a bit hesitant about wearing it out but you've all persuaded me otherwise. Although I do suspect that all of you lovely ladies subscribe to the if you don't have anything nice to say don't say anything at all school of thought 'cos I don't often get critical or horrible comments! 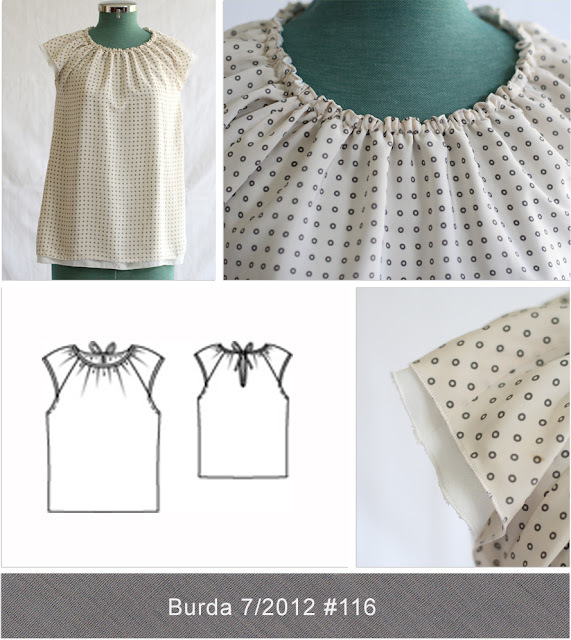 Angela - I once did a whole post (here) on tracing paper for use with the Burda mags, and the comments to that post are really helpful in finding good sources of tracing materials. I've since changed from rolls of paper to rolls of cheap, thin interfacing for tracing - the patterns are bulky when folded up in an envelope but the pattern is more durable, doesn't always need to be pinned to the fabric because often the fabric grabs the interfacing and it doesn't shift when cutting, and best of all it's usually cheaper than tracing paper too! The two best patterns in this issue IMHO are the two plus sized dresses, but I have neither the patience nor the required skills to grade down, so in the end I settled for top 7/2012 #116. It's not breastfeeding friendly or child friendly since I made it from silk, but I'm hoping one day to venture out sans children and when that day happens I'll be ready! Looks pretty cute doesn't it? I used a cream coloured silk with tiny little grey circles on it that I had in the stash, with a white polyester layer underneath. 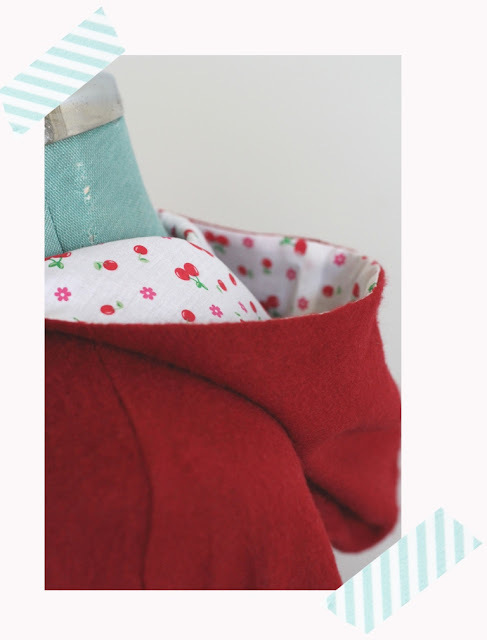 The pattern calls for the inner layer of fabric to be sewn to the outer layer as interlining, but I chose to keep my two layers separate, joined only at the neckline and underarms. I made the white under layer a little longer so that it would peek out at the sleeves and hem, and instead of binding the edges with self fabric bias I made roll edged hems instead. The other change I made was to sew a casing at the neckline and insert a narrow elastic instead of gathering the neckline and shoulder seams and binding the edges - I did this because I was too lazy to do the gathering or make the bias! Plus doing an elasticised neckline meant I also didn't have to do the opening at the back either. 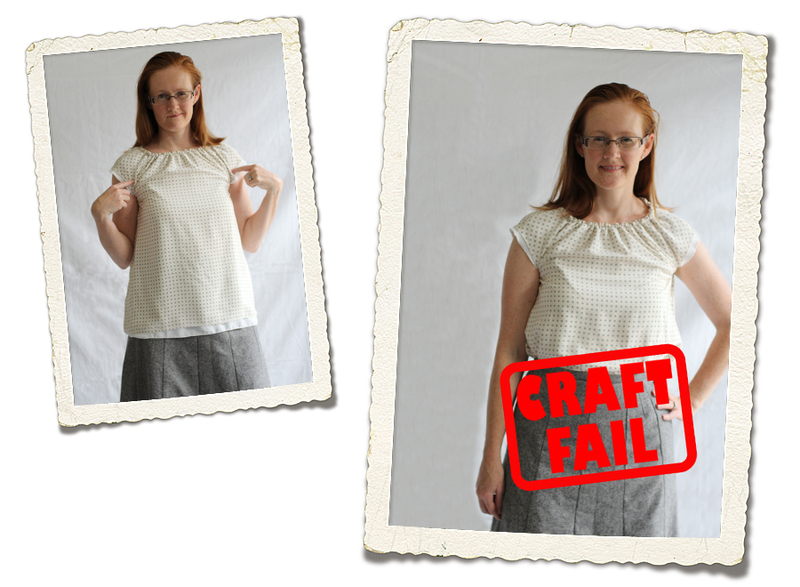 Sadly this top is a major craft fail and is unwearable. And because I don't have any fabric left I can't repair it either, all I can hope is to remake it into something else because I do like this fabric. When I finished the top it fitted nicely around the neck, but gaped so widely under my arms that a good view of my bra strap was available. So I pinned it in a bit at the sides and took in the side seam a few centimetres down each side. Did I mention that apart from the top stitching for the elastic casing at the neckline I sewed all of the seams for this top on the overlocker, to save doing French seams? Well I did, which made it very quick to sew but it's a rather final way of making something. And so when I came to take in those side seams along where I had pinned it I just used my overlocker, instead of basting the seam like any sane sewer would do. And clearly I took in too much along those side seams, because now it is so tight that the top rides up and causes those strain lines you can see in the above photos. Sigh. So, lesson learned - less haste, less waste; measure twice, cut once; blah blah blah blah. I may make this again in another fabric because it is a nice simple top that would look good over jeans for casual wear or even under a suit when I go back to work. And with the changes I made (apart from the major stuff up of course) it was pretty quick to sew. But for now onwards to the August project which is traced but not cut out yet. 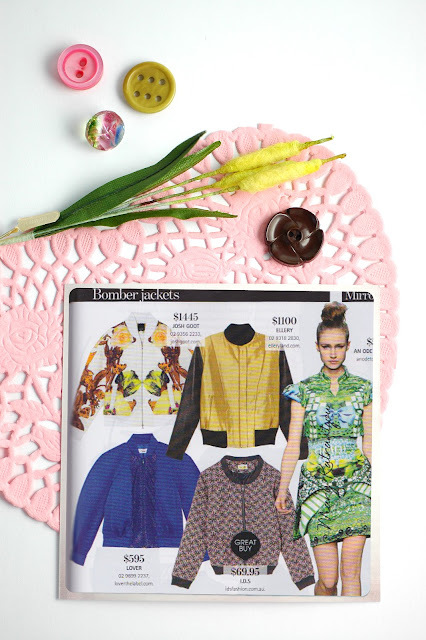 And the September issue arrived the other day and it's really good - I love their autumn issue!